Did you know there are 4,800 ‘experts’ on Bermuda on social media? At least that is the number Klout says there. The social influence ranking agency computes its top 10 on the subject with Bernews leading the way. The Bermuda Tourism Authority is second followed by Nothing to Do in Bermuda, Bermemes and The Royal Gazette. 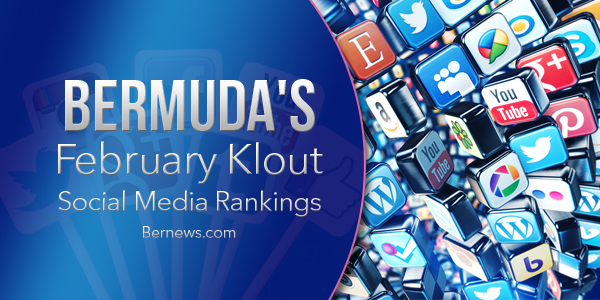 The Bermuda rankings do not match the overall Klout score as it counts Bermuda-related posts. Overall, FOX and WWE commentator John Layfield remains number one with a score of 85. He is followed by the BTA then a three-way tie for third among Bernews, and musicians Heather Nova and Collie Buddz. Bermemes jumped into the Top 10 and is seventh overall. MP Diallo Rabain had a pick jump in his score thanks to the recent by election. Grotto Bay Beach Resort made the Top 50 for the first time with a score of 61. All scores were recorded from February 13-14, 2016. Klout attempts to quantify a person or business social media influence through a variety of platforms, including Twitter, Facebook, Instagram and LinkedIn, among others. The scores run from one to 100 with 40 being average. You can check your Klout score at www.klout.com. If you have a Klout score of 60 or higher and were not on this list, please e-mail him at dburgesspb@gmail.com or Tweet him @DonBermuda. Don Burgess is the former deputy editor of the Bermuda Sun newspaper who has earned certifications in social media and inbound marketing through Hootsuite, HubSpot and Lern University. If you have a Klout score of 61 or higher and were not on this list, please e-mail him at dburgesspb@gmail.com or Tweet him @DonBermuda.